Most people have heard of Ancestry.com; that may be the reason your patrons showed up, having received a DNA kit as a gift. But how can you help the new genealogist who doesn’t have access to a paid account to Ancestry? And what if your library doesn’t, either? Some of the best known websites for genealogy require a paid subscription, but there is also a lot of free information online. I’m going to highlight some of the biggest free websites, but there are many more resources out there. Knowing how to find them is the trick! http://www.cyndislist.com organizes thousands of genealogy and history websites by topic. I like it because Cyndi thinks like a librarian. https://www.familysearch.org/wiki/en/Main_Page is the Research Wiki for FamilySearch.org. The availability of genealogy information in places around the world is given in research guides specific to the county level in the United States. This is the place to go to be pointed to local government offices who can be contacted for questions about records, which may or may not be online. https://www.familysearch.org/search/catalog/search is the catalog of the Family History Library in Salt Lake City. Searchable by surname, subject, and place, you can view the book, microform, and digital holdings of the largest genealogy library in the world. Some digital holdings are viewable from your home computer; others can only be accessed through a Family History Center associated with the LDS church. These centers are manned by knowledgeable volunteers and open to everyone. https://www.accessgenealogy.com/ is a growing site with online data from around the US. Take a look and see what you can find! http://www.archive.org is a site you may have run across before, the Internet Archive. They have tons of digitized books, including old county histories, which are fully keyword searchable. They also have all of the US Federal Census microfilms through 1930 scanned and available here, though not indexed. http://www.archives.gov is the home of the United States National Archives. They have a lot of finding aids although very little of their information has been placed online so far. This is where to go when people want military records. The 1940 census is available here, as well. https://www.familysearch.org/ also has searchable databases of names gleaned from various records as well as family trees. Use caution when recommending this to beginning researchers since there are a lot of undocumented family trees with conflicting information and it could easily become overwhelming. http://www.findagrave.com is an online cemetery database. Some names have additional information added, such as photos (of headstones and/or the person), obituaries, and family information. https://books.google.com/ Don’t forget about Google Books, which has millions of books fully keyword-searchable, though most will need to be purchased or interlibrary loaned in order to read the full content. http://www.genealogycenter.org/ is the website for the 2nd largest genealogy library in America, located at the Allen County Public Library in Indiana. The site is not limited to Indiana information and also offers an email Ask a Librarian service. https://www.libertyellisfoundation.org/passenger has 65+ million passenger records of people who passed through the Port of New York and Ellis Island between 1820-1957. You can view the ship manifests with a free account. http://fultonhistory.com/ is an astonishing one-man venture: Tom Tryniski of Fulton, New York, has single-handedly scanned and made available online over 44 million pages of newspapers from the US and Canada…and it’s growing every week. The website can be tricky to navigate and is prone to periods of downtime, but well worth exploring. https://www.raogk.org/ is a directory of volunteers who perform Random Acts of Genealogical Kindness by looking up records in specific locations around the world. Some offer courthouse research, obituary lookups, or headstone photos. There is also a Research Guide providing information about what kinds of records are available in different localities. http://www.usgenweb.org/ is the launchpad for the USGenWeb Project, a collection of websites independently created and maintained by volunteers. Each county in the US has a website that is linked from each state’s website. The content of these sites varies wildly, depending on the ability of the volunteers running them, but you may find information here that isn’t available anywhere else. The http://www.worldgenweb.org site lists other countries with similar projects. There are many other resources and outside organizations you can recommend to your patrons, in addition. Genealogists love talking with other genealogists. Your community may have a genealogical or historical society with regular meetings. Provide contact information to your patrons, and, if your library has meeting space, consider reaching out and offering it to these societies. Make a point of finding out about the genealogical holdings of libraries and archives around you. For example, even though my library system doesn’t, the State Library and Archives of Florida offers patron access to Ancestry.com and has many newspapers from around the country on microfilm. Genealogical libraries within a few hours’ drive can be a nice day trip for a researcher. Don’t forget about your local Family History Centers. They are not restricted to members of the LDS church and usually have very knowledgeable volunteers who can help anyone use their resources. There are countless Facebook groups for genealogy. City, region, state-specific, obituary lookups, cemetery photos, DNA, adoption help, etc. 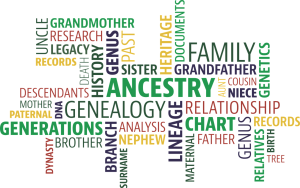 A good group for beginners is simply called Genealogy. Most people in these groups are very helpful. Some offer to look things up for others using resources available to them or help brainstorm when someone can’t read old script. There’s even a very talented group of volunteers who edit scanned photos to fix blemishes, creases, or sometimes even draw two people together to create a portrait where there wasn’t one before. Obituaries from other libraries can often be obtained through a reference request, but libraries have varying policies on how to go about requesting them. Some require ILL requests for the microfilm, while others will scan and email you an obituary. If your library’s policy is not already on your website, please consider doing so. Also, consider adding your library’s genealogy/obituary policy/information to the Ask a Librarian Knowledge Base, so that librarians around the state are better able to point patrons to your resources. Best wishes in the new year with your patrons’ newfound interest in genealogy! Anything that brings patrons to (or back!) to the library is a good thing! Thank you for all of the good information, I will share it with my researchers.